Time has a way of zipping by in a blur, yet there are some things that stick out in one's memory. It was back in 2007/2008 during my then nascent rebirth into the Anglican Faith, and I was searching out some "witness wear" to tell the world that this one-time Pentecostal Preacher had traded the sawdust, for the Canterbury Trail. In searching the internet for T-shirts, I found one that jumped off the screen and said click on me please! It was a white, sleeveless T-shirt emblazoned with a Celtic Cross, flanked by two figures who I perceived to be Augustine, overlaid onto a pair of open wings. Perfect for showcasing ones guns in the gym while speaking to ones spiritual zeitgeist. In retrospect, my guns were larger in my mind than in reality. A Decade later and though I'm beyond wearing that T anywhere away from the pool or hot tub, I'm still drawn to its simplistic but powerful message. 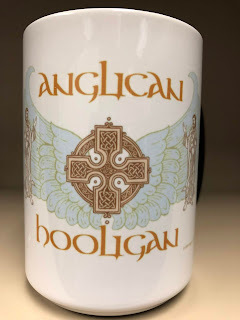 The expression, "Anglican Hooligan" easily creates a dichotomy. The words themselves at first take seem absolutely antithetical to one another. The word Hooligan conjures up pictures of a rough, rowdy and unrefined sort who lowers the property value of whichever neighborhood they move into. "Anglican" on the other hand paints a more refined image. Polite to a fault, ensconced in Tweed and faintly smelling of pipe smoke; one might typically envision the Anglican as a gentle, unoffending sort who'll go to great lengths to preserve order and tranquility; one who goes along to get along. Many Americans too, have a misunderstanding of Anglicanism in general that can be born out of either ignorance or prejudice, depending on how its manifested. On numerous occasions, I've had people say, upon learning of my Faith expression,say something along the lines of "Aren't you people just like 'Catholics'?" or with a whiff of derision, "you people are pretty much 'Catholic-lite"anyway, right?". And of course today, now that the executive leadership of the American Episcopal Church is finding itself to the Theological and Social Left of the Unitarian Universalists, many of these same people will dismiss Anglicanism altogether as a sub-christian sect. But even for those who have a grounded understanding of Anglicanism, the term can be incongruent. The couplet can almost seem to create the image of Andy Capp meeting the Vicar. For a moment or two, take this invitation to reimagine the moniker in light of some historic truths. Christianity was spread through the world by men whom polite society would have easily considered Hooligans; crude hayseeds and fishermen who came into towns and cities, upsetting the settled order with strange doctrines. These men and women were bold, unapologetic, and unafraid. They engaged and rocked their worlds without fear of reprisal, often to their own demise. This same spirit was evidenced in the Sixteenth Century with the birth of Anglicanism. When Mary Tudor attempted to extinguish the flame of Anglicanism through her own backfires, kindled with the bodies of the faithful, "protestant hooligans" chose death over the shame or recantation. In our own time, we're surrounded by Anglican leaders who stood the red line over the issue of historic orthodox Christianity when many of their peers were either willfully surrendering, or simply acquiescing to the social and cultural mores of our day. I consider these facts in the light of the Eleventh & Twelfth Chapters of the Letter to the Hebrews and see a cloud of witness that continues to grow larger by the day. So, how are we to make application of this as we live out or lives as Third Millennium Anglicans? Whether we live on the Left Coast, in Hagerstown, Suburbia Majora, or in your town, the guiding principals remain the same. To be a fruitful, reproducing Christian is to live out one's life in a scrum. We are called to move the Kingdom down field to the goal, which will be actualized when our Messiah and Lord makes his ultimate return; that day when, as stated in the historic creeds, "He will come again to judge the quick and the dead, and that His kingdom will have no end." Yet the fact that we exist in this scrum implies that there is an opposing side to the scrum that is working at cross purposes to staunch the forward momentum of our line. This triad of the World's system, our own fleshly nature, and our Adversary the Accuser is working tirelessly to blunt, slow and stop our forward momentum for the Kingdom of God. Clearly, this is not a place for the timid who've no stomach for the struggle. The Casper Milquetoast follower won't survive for very long in this scrum and will be shoved to the sideline, and rendered ineffective. 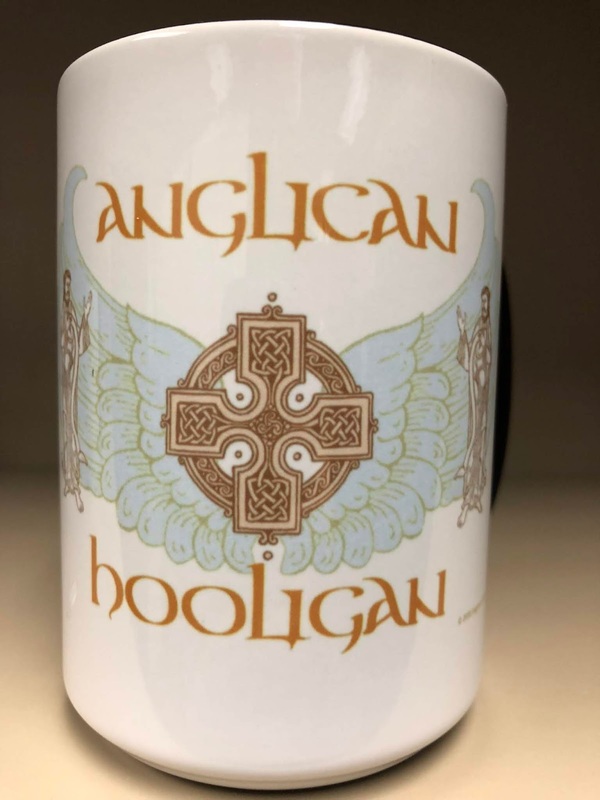 So, to be an Anglican Hooligan is to move forward without fear, possessing only the fear of the Lord (to do so otherwise is mere arrogance, not fearlessness). Understand, Though I've written this from the perspective of an Anglican, these principles are universal to any orthodox expression of Christianity. Regardless of your worshipping community, you've been called to move forward in faith, with full confidence in the one who called and redeemed you, and continues to empower you through His Holy Spirit. Game on Hooligan! keep plowing down field until you hear the final whistle. Maranatha! "Left Coast, in Hagerstown, Suburbia Majora" but not a hint of it in North Dakota.